It's now official. Since this Saturday (Apr 24 2010) AirNav Systems Forum is the world's biggest and most important Virtual Radar Community. 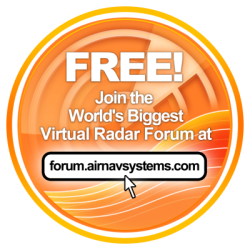 In other words forum.airnavsystems.com is the place to be for unbiased, positive and innovative Virtual Radar discussion. This is where the experts are: from hobbyists to aviation professionals. AirNav Forum was created 2 years later than its predecessor but with an enormous growth rate we now have more members and more messages/month (actually we double this value) than our predecessor. It is important to mention that the forum follows restrictive subscription rules where only genuine members are approved.